Selene off Santa Barbara in 1962. Selene (#) (-), a Pacific Cruising Class Yacht ~ 46-foot racing sloop with hull No. 3 of Kettenburg Marine. 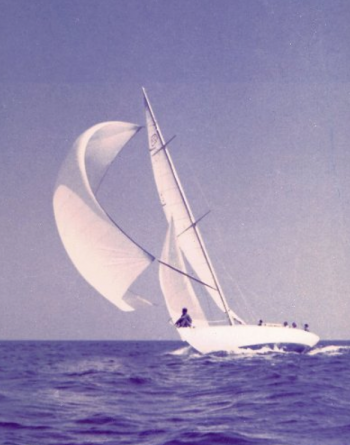 Selene was originally owned by Ed Witte who sailed her in the 1947 Transpac Race. Witte sold Selene to Ed Vail in the 1950s. Vail used Selene to sail back and forth to Santa Rosa Island, which he managed or Vail & Vickers until his death in 1962. Vail sold Selene in 1960 to her third owner, Ken Urton. Today Selene is berthed in San Diego. "'Uncle Ed' loved the breeze and did not mind heeling. We sailed the windward leg with the working jib and reefed main. The tops of the lifelines and winches were almost always under water and the leeward side of the cockpit awash. We tried to convince 'Uncle Ed' that this was not fast, but he was in his element. We were first to the weather mark, so he must have been correct. After a downwind leg and a reach there was a short upwind leg and run to the finish. As we rounded the last upwind mark and bore off there was a vast sloshing sound from below and as the boat stood up she settled so low in the water you could touch the ocean standing on the cockpit floor. A quick look below confirmed the worst. We were sinking. There was a foot of water over the floorboards below and the water in the cockpit was up to the threshold. The engine was completely under water. We abandoned the race and sailed into the lee of Stearns Wharf pumping and bailing with buckets. We were gaining on the water. No more was coming in. As it turned out, the covers for the winch handle pockets by the grandfather seats had not been put in and they open into the bilge. All of the hard driving sailing was keeping these large holes under water and happily filling up the boat from the ocean. We did not sink, but "Uncle Ed" had a serious repair bill. Selene, PCC #3, was originally owned by Edward White who sailed her in the 1947 Transpac. In the 50s Ed Vail, a principal of Vail Vickers, which ran cattle on Santa Rosa Island owned her. Ed sold her to my father, Ray Dawley, in 1960. Subsequently my father sold her to Ken Urton. Ed, Ray and Ken, lived in Santa Barbara and were members of the Santa Barbara Yacht Club. The Edward N. Vail Perpetual Island Race Trophy (1961) is at the Santa Barbara Yacht Club. This page was last edited on 20 May 2017, at 17:19.